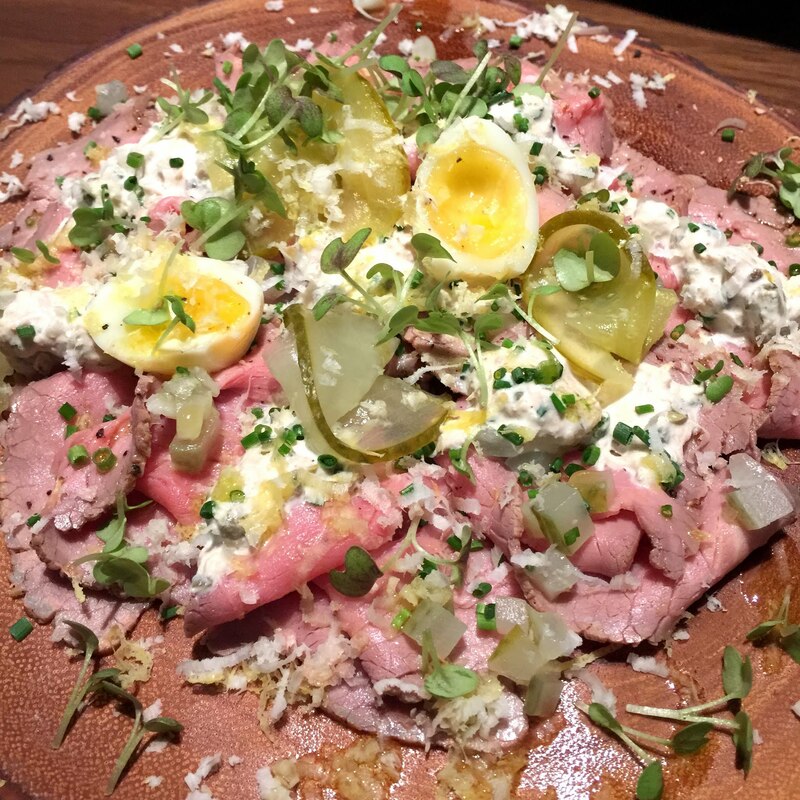 Take for example this Roasted Veal Carpaccio ($26) from the cold starters section. I've had beef and horse carpaccio but not yet a veal version. These pinkish slices were succulent and not too gamey, tossed in shredded tuna dressing and dill pickles for a refreshing vibe. 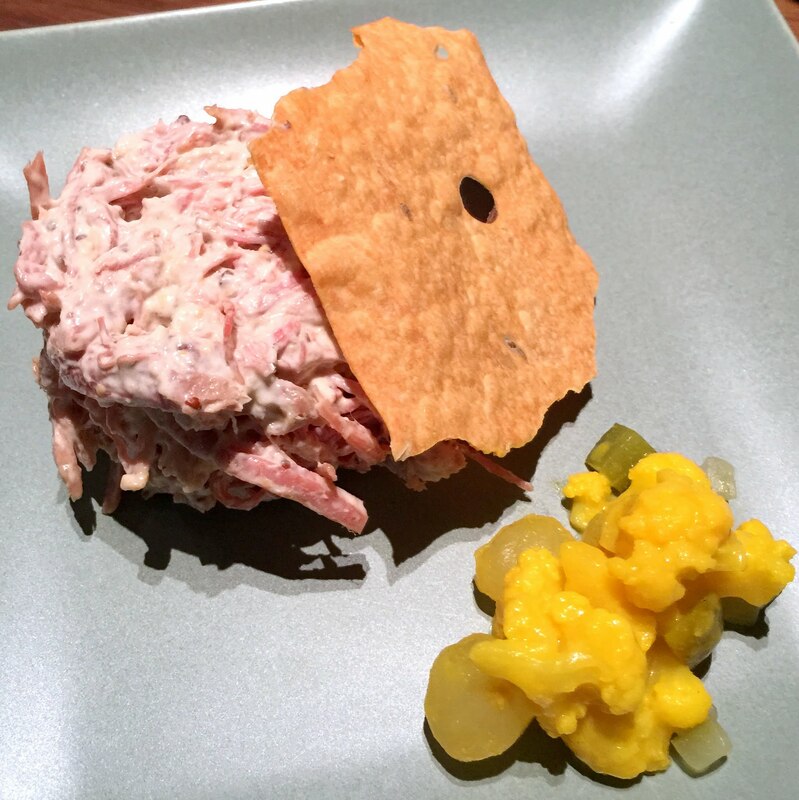 For a classic Scottish dish, try the Potted Salt Beef Brisket ($18) with grain mustard and piccalilli (a kind of salty-sour Indian relish). Some might think of it as corned beef, but I say this is more like a funky British-Indie hybrid that makes a fabulous filling on the aromatic caraway crackers. 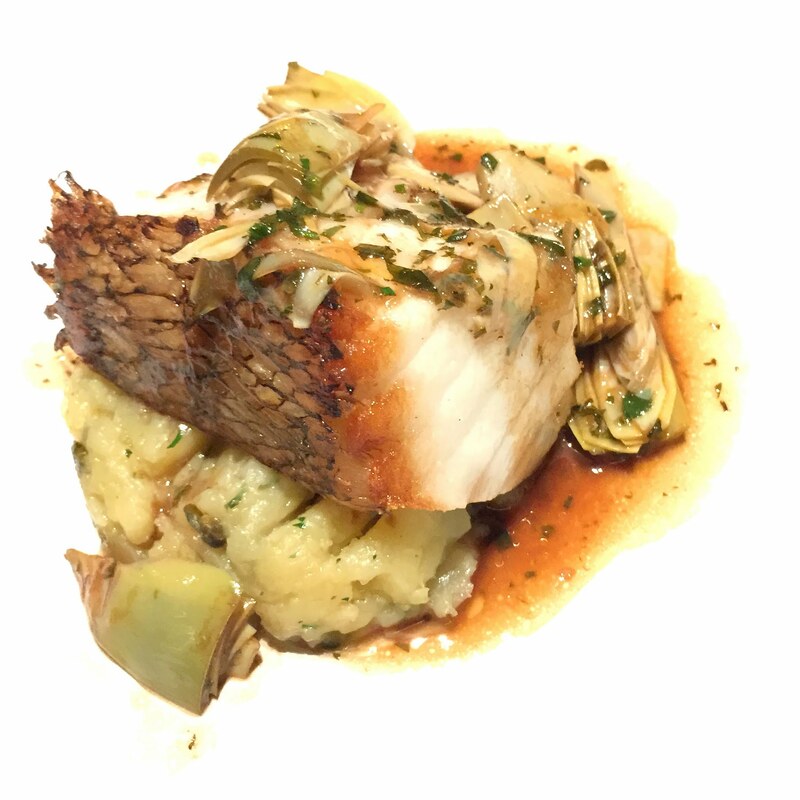 Main courses range from $26 to $44, with the Roasted Black Cod ($44) being ranked at the top of the list. Not much complicated cooking involved here, but it was a straightforward dish that would speak to your soul with its impeccable freshness in a mellow red wine and lemon sauce. In fact, the sides of crushed potato, salted capers and artichokes complemented the fish so well that this dish would be incomplete without one element or another. 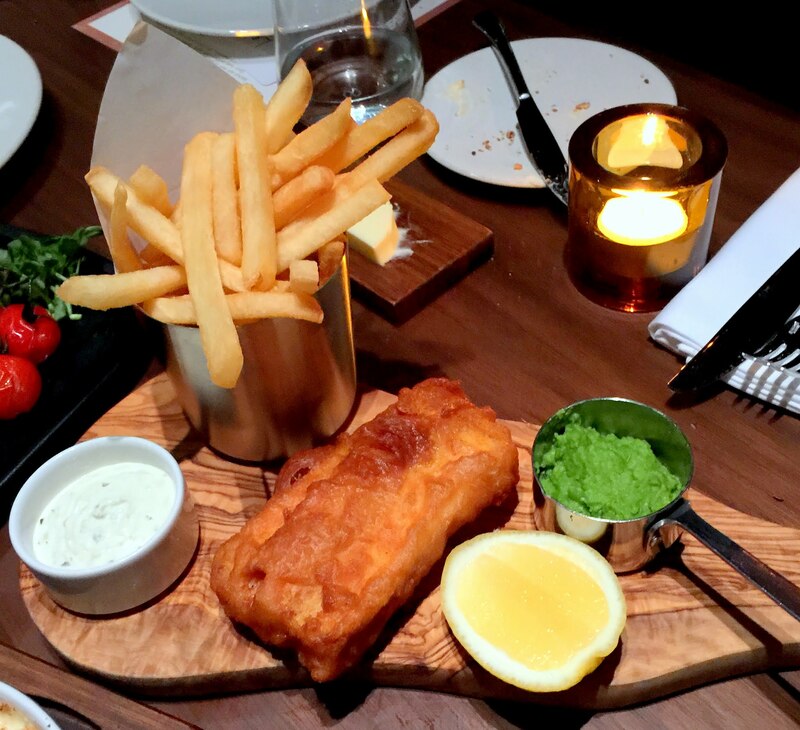 That said, the elegant cod fish did not make quite a big splash compared to the Traditional Fish and Chips ($26). The fish beneath the golden crisp batter is meaty yet delicate, needing no further adornment other than the likes of tartar sauce and sweet crushed peas. As such, one will commit a grave mistake to strike this classic British beer food out from the menu because this may just be one of the most delicious version you can find outside UK. Another star dish was the Dingley Dell Pork Belly ($28). 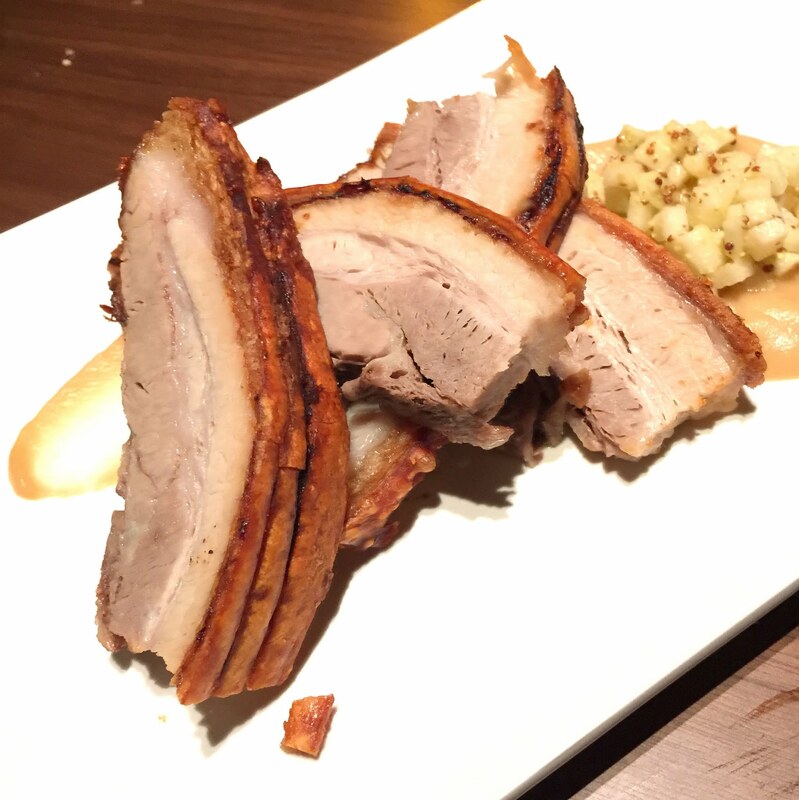 As the name suggests, the pork is sourced from a welfare-friendly outdoor pig farm in Suffolk, England. 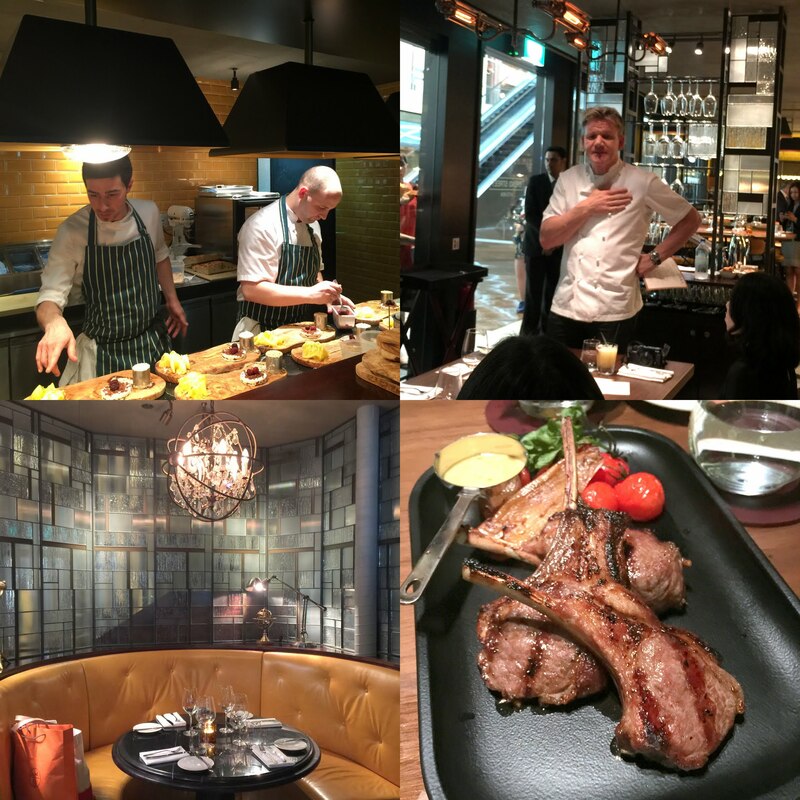 The crunchy bites of the golden crackling was symphony to the ears and the meat was tender without being greasy. Brightened with the light acidity from spiced apple puree, this dish can be paired with a selection of innovative cocktails and world wines from the "interactive" bar area overlooking the scenic waterfront of Marina Bay. 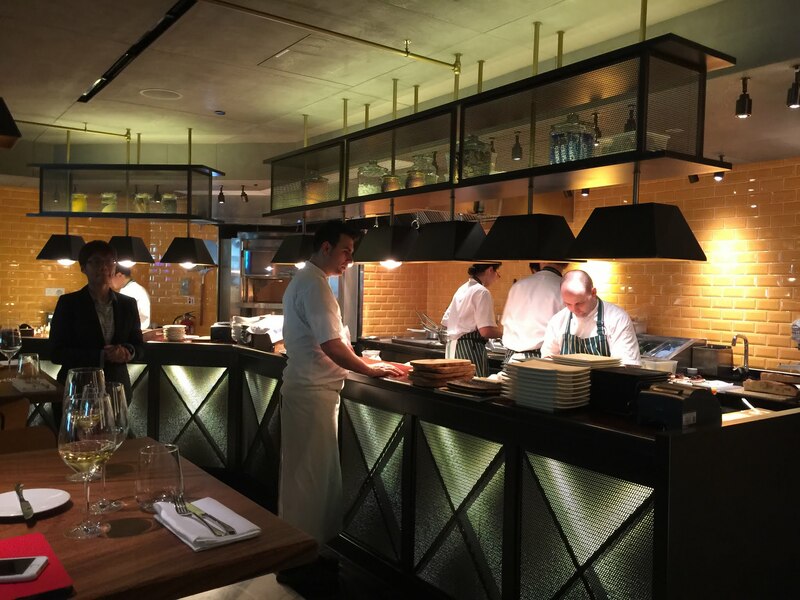 Most restaurants often neglect the desserts section but Bread Street Kitchen is a rare exception with eight options, each of high calibre. The Monkey Shoulder Cranachan Cheesecake with Roasted Balsamic Strawberries ($18) won the hearts of many with its playful textures of thin cocoa crisps atop the sticky pud but this dish has the potential to up its ante on the complexity given that it costs about 3-4 times more than a cheesecake from an average patisserie. The Chocolate Fondant with Salted Caramel ($20) was profound in cacao notes but I preferred the Coffee and White Chocolate Parfait with poached blackberries ($18) as its incredible soft and cloud-like texture—somewhat in between an espuma and crème fraiche but not a panna cotta—came as a welcome surprise. The subtly sweet fluff dissipated within seconds in your mouth, leaving behind traces of alcohol scents which stubbornly lingered on. 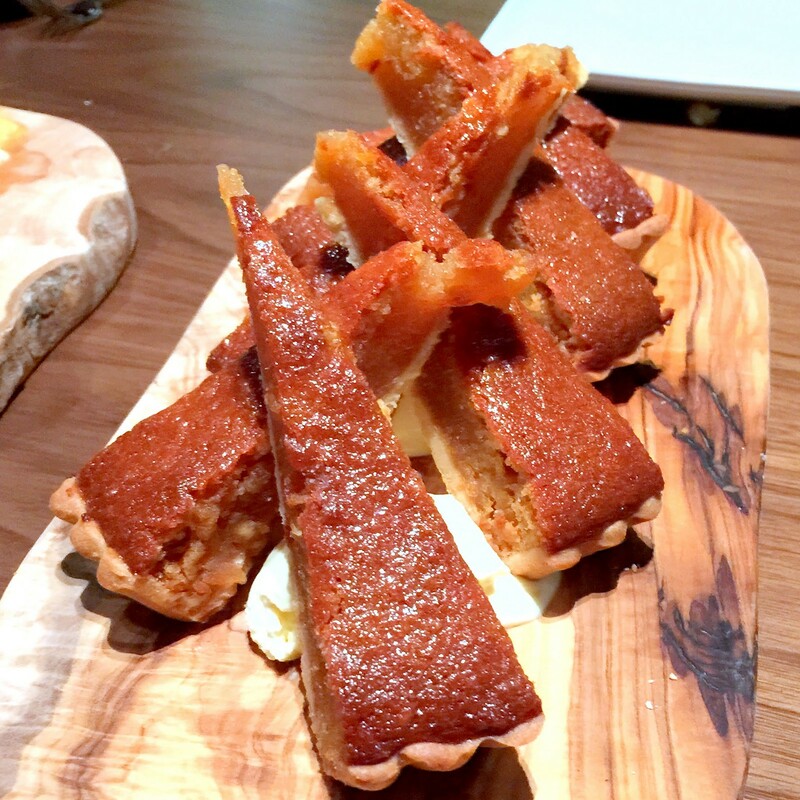 For a truly old-school British dessert, nothing beats the Treacle Tart with Crème Fraiche Ice Cream ($18). With golden syrup being a non-negotiable ingredient of this dessert, the sweetness might not rally enough supporters but there was a nice, sticky chewiness to the filling cupped within a superb crust. 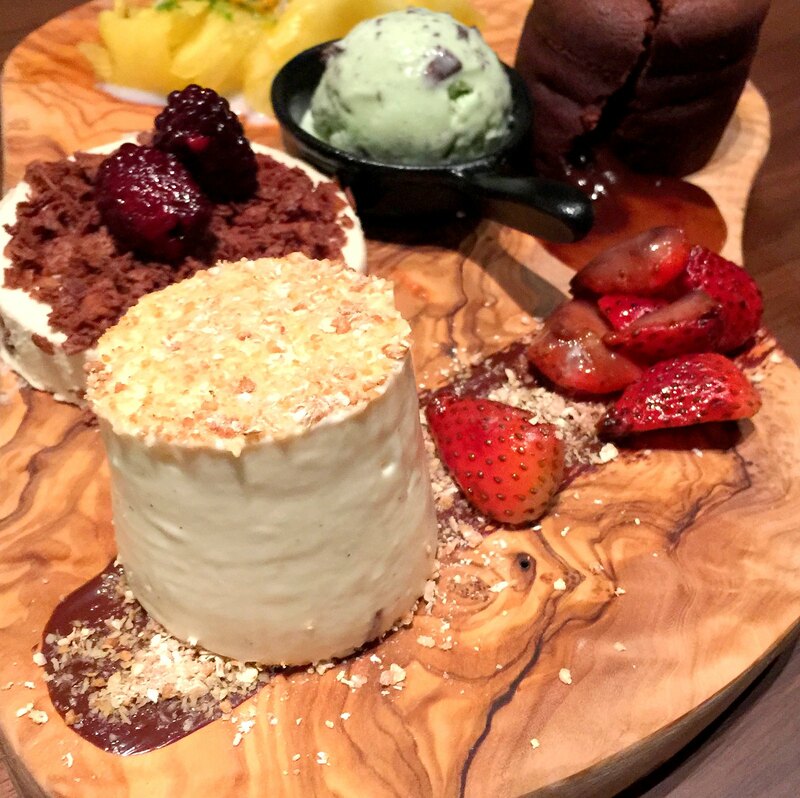 Otherwise, the unique Pineapple Carpaccio with coconut sorbet will bring a zesty and rather unpredictable ending to a British European feast. As Chef Ramsay said at the start of the meal "You'll want to share a bed with the desserts tonight" Yes, he may be a controversial public figure but when it comes to his food, I think there is nothing much to dispute about. 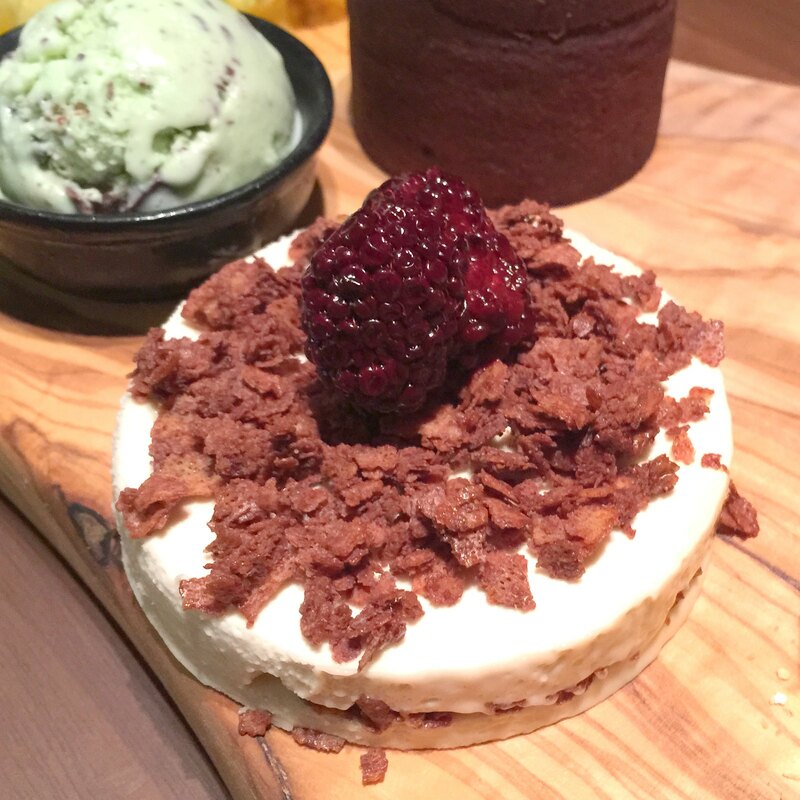 Photograph and written by Li Tian, a passionate foodie behind Singapore-Japan Food Blog “Dairy & Cream”. Has an eye for pastries and desserts.